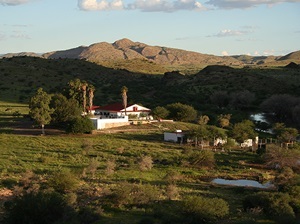 Eagle Rock Guest Farm is only 35 km from Windhoek, surrounded by the rolling hills of the Khomas Highland. The operators of Eagle Rock, and thier friendly staff will take loving care of all thier guests. Eagle Rock offers accomodation in spacious two-bed or double bed bungalows with large bathrooms (Wheelchair friendly), free Internet and a crystal-clear pool. 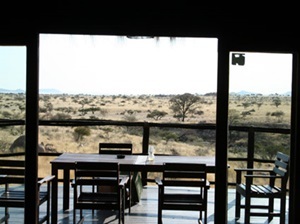 Stunning view of the seemingly endless horizons of the Namibian Savannah and its renowned African sunset, a paradise for nature and birds lovers only a few kilometers from Windhoek. Hochland mountains. Shaded by Camelthorn trees, the lodge is testament to the ingenuity of an eco-friendly design. The lodge offers 6 individually style units and one family unit tastefully furnished,which a choice of reed, brick and thatched chalets, each with a private bathroom and secluded outside deck. Each bedroom contains 2 three quarter beds and a double bed sleeper couch. Generous spacing between units ensures complete privacy. Hochland Nest caters for functions of up to 30 persons and is a mere 40 minutes drive from Windhoek.It is the ideal breakaway from the city or for a tourist to start or end their journey in Namibia. Hochland Nest is perfectly located next to the Friedenau Dam, which contains water throughout the year. Nature drives are conducted in open 4 x4 vehicles. Other activities offered are morning walks, bird watching, fishing , camping at the Friedenah Dam, Walking Trails , Nature or Sunset Drives, Sunset Boat Cruises, Fishing, Swimming Pool and Half day boat trips (max 3 people). Tucked away in the rugged, burned mountains at the edge of the desert, another kind of paradise awaits you: Ilala Private Game Reserve. Situated 170 km from Windhoek lies the reserve with its 45 000 acres of untouched, awe-inspiring landscape full of game and wilderness. Although the homestead is only a few miles off the main road, it will seem as though it is the gateway to a different world. Seated on the white-washed verandah, enjoying a thirst quenching sundowner, you can bear witness to an unsurpassed African sunset as it paints the slopes of the Gamsberg Mountain in hues of pink and mauve. 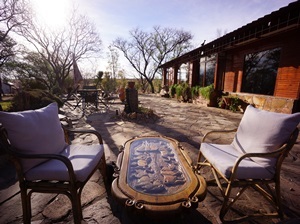 The old colonial style ranch house was built by the legendary Johann Vivier. A man who made his fortune with diamonds in the days when Africa abounded with adventure and wildlife. There is a large variety of entertainment and recreation activities at Ilala. The wildlife and landscape can be explored either on guided walks, by four-by-four vehicles, on horseback or from the sanctuary of the verandah. An inviting pool as well as many shady spots bid you to linger. Bushman paintings can be admired at two separate locations on Ilala. 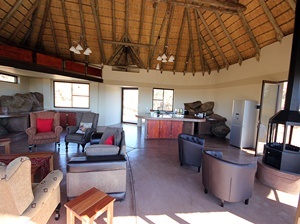 Etusis Lodge is only a 2½ hours drive from Swakopmund or Windhoek and situated in the Etusis Nature Reserve which covers more than 21,000 hectares & is approximately 1,200 meters above sea level. The lodge fits in harmoniously with the environment. The 7 bungalows are placed harmoniously into their surroundings, each for up to 4 persons. There are also 5 luxury tents, for up to two persons, available. There are central restrooms, washing facilities and showers. The tents are far enough from each other to make sure that you will hear nothing but the sound of the African wilderness. There is also a farm house on the Etusis Wildschutzgebiet with optional 1, two, three or 4 bedrooms. In addition the farm house offers a Sitting room, Dining room, big Kitchen-living room with cooker and fridge as well as pantry / storeroom and 4 baths. 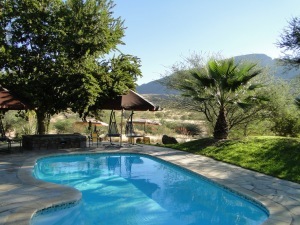 Since the Lodge lies only 400 m from the farm house, you can dine in the Lodge restaurant and use the swimming-pool. Optional Activities offered at Etusis are hiking trails, horse riding and since very recently rock climbing. Rostock Ritz Desert Lodge invites you to experience the Namib Desert combined with memorable hospitality, personalized service and soul reaching tranquility. 11 traditional African style round buildings with en-suite facilities and own balcony are naturally integrated in the surroundings and offer unlimited views across the Namib. An excellent choice for the ultimate African holiday. Solitaire Guest Farm Desert Ranch is the perfect location from which to base your day trips and excursions to the surrounding highlights. The Farm is situated at the foot of the rugged Rand Mountains with a breathtaking view over the vast Namib Desert and beautiful Naukluft Mountains. Enjoy one of our authentic African themed single or double en-suite rooms, our luxury self catering house or camp at our peaceful campsite with amenities. The en-suite rooms are located in the original 1950's farm house. 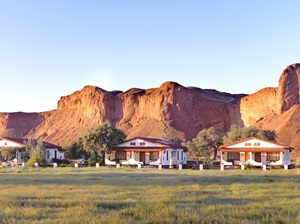 Namib Desert Lodge is located at the foot of a red sandstone cliff, which consists of the fossilized dunes of an ancient Namib. It is situated just 60 km north of Sesriem. Located in the Gondwana Namib Park is shares a border with the Namib Naukluft Park.The (fossil) dunes overlooking the lodge are 20 million years old and contain fossils of the ancestors of the modern day Ostrich. They are evidence that an earlier Namib existed. 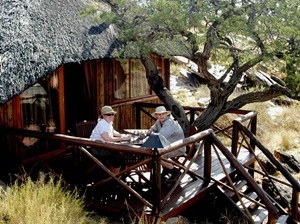 Namib Desert Lodge is set amongst tall trees and palms. The main building has a reception, bar and a large verandah with outside seating for guests to admire the surrounding scenery. There are also 2 swimming pools. Breakfast and dinner are served buffet style and a small selection of light lunches can be ordered on request. Their cozy bar is well-stocked with South African wines. Accommodation is in 65 double rooms. They are all equipped with twin beds, en-suite bathrooms and air-conditioning. 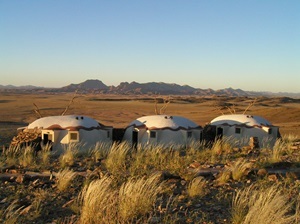 Namib Dune Star Camp is the newest of Gondwana Lodges set aside on the premises of the Namib Desert Camp. Escape from the world. A short guided hike leads you into a vast desert wilderness and to nine wooden cabins. After the dunes have transformed to gold and the distant mountains glow purple, it’s time to wheel beds onto balconies for a night under the glittering sky of the Namib. 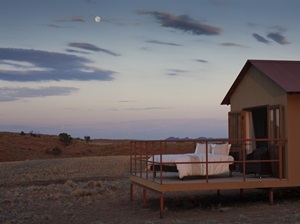 Situated in the heart of the Namib Desert, some 300 kilometres south west of Windhoek and bordered on three sides by the Namib Naukluft Park, Weltevrede Guest Farm is the home of abundant wildlife and gateway to the famed Sossusvlei dunes and Sesriem Canyon.Nestled amidst a spectacular mix of rugged mountains, shifting dunes, harsh gravel plains, dusty prehistoric river beds and endless Camel-thorn trees (Acacia Erioloba), you'll find Weltevrede a welcome oasis of friendly hospitality at the end of your adventuresome day. 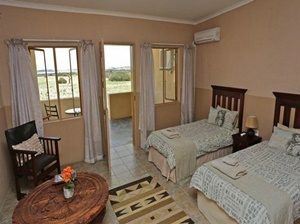 Accommodation consists of twelve separate rooms, each en-suite and air-conditioned, overlooking the Namib dunes on the farm and 4 Camping sites, each with own private toilet, shower and basin.Generally the number of guests is limited to ensure a very personalized service. After all, with the name “Weltevrede” meaning well contented, our aim is to ensure that you experience its full meaning in a totally eco-friendly environment.